Anyone who has done any tiling understands that the saw is just one piece of the puzzle. Certainly, with a saw moving at three to ten thousand rpms, putting a thin kerf blade might cut just about anything, but the quality of cut, longevity of the blade, and effect on the saw might encourage any wet saw user to have the proper blade for the task at hand. Considering the cost of blades, it is important to know what to look for when it comes to a diamond blade. But why is there such a huge selection of different diamond blades out there, even within one brand? How does a person understand and differentiate between the hundreds of unique qualities and styles? First, a diamond blade is made from high quality steel, but as the name suggests, there are actual diamonds scattered throughout the blade. However, these are not the diamonds found in engagement rings – thank goodness. They are typically synthetic and produced through high-pressure, high-temperature synthesis in order to produce the most efficiency for cutting. The diamonds can be bonded to the blade through a variety of different methods—typically with sintered metal powder—and these methods can affect the blade quality, but the bond is the most important thing to understand when it comes to diamond blade makeup. The bond varies between different levels of softness and hardness, and in addition to giving a base for the diamonds, the bond allows for a specific wear rate to match the material being cut. Often, the bond hardness is the inverse of the hardness of the material. For instance, with porcelain, the bond needs to be soft so that it will wear down proportionally in order to expose new diamonds and provide a clean cut. If not for the longevity of the blade, almost all blades would use a soft bond, which would constantly expose new diamonds away from the bonded steal for a clean cut. However, this negatively impacts the lifetime of the blade, so almost all manufactures use a hard bond for softer materials to vastly increase the lifetime. This is why companies have so many different types and qualities of blades. In general, higher quality blades will last longer due to the bonding matrix that is used. Although it is uncommon for companies to disclose the bonding method, it is important to look at the packaging to see what the manufacturer suggests in terms of each blade’s cutting capability. This will tell you the blade’s optimal performance and longevity. Moreover, if you are cutting hard materials and find that the blade is either sparking or bouncing, you have likely chosen the wrong type of blade for the material used, which can glaze the blade. Remember, it is an inverse relationship for cutting with a diamond blade: If you want to cut a hard material, you need a soft bond; for a soft material, you need a hard bond. If you cut a hard material with a hard bond, you will glaze the blade, and it will require dressing. Usually, to fix a blade you can use a dressing stick or just run the blade through a soft material like asphalt to expose more diamond material. The Segmented Rim blade gives the roughest cut and is used for concrete, brick, concrete pavers, masonry/block, hard/reinforced concrete, and limestone. This blade is usually referred to as a dry cutting blade. The reason that it can be used on dry applications without water is due to the cut outs—or segments—on the edge of the blade. These allow for air flow and cooling of the blade core. The segments also allow for better exhaust of debris, allowing for a swifter cut. One of the risks to the lifetime of a diamond blade is overheating, which affects the bond and can warp the blade. Segmented blades are the best option when water is not available; however, if a person tries to use a segmented blade on, for example, a tile, more often than not that blade is going to chip the tile, leaving an awful finish. 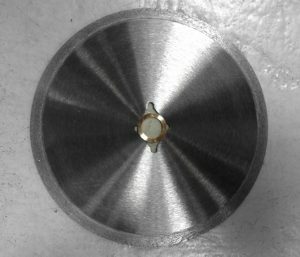 The Turbo Rim blade is specifically designed to cut faster in wet or dry applications. The smaller segments on the rim allow for cooling of the blade with an integrated interweaving diamond matrix. The turbo rim lets air pass through its smaller turbo segments, which has a cooling effect on the blade. You might notice the small holes scattered throughout the blade as well. This is a common practice for many manufactures to increase the cooling capabilities of their blades. This blade cuts faster due to the design of the turbo segments pushing the material out. This blade effectively cuts concrete, brick, and limestone materials. The Continuous Rim blade is most commonly referred to as a wet cut blade. 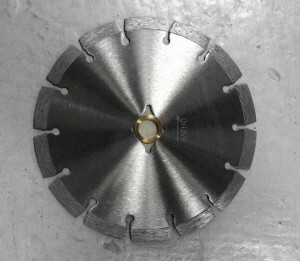 There are a few advantages to using water when cutting material: Water significantly cools down the blade, allowing for longer life; it flushes out any debris to lessen friction in the cutting zone; and it reduces dust, thus preventing dust from building up in the cracks of the tool, which would decrease its lifetime. The continuous rim cuts the slowest of any of the different styles of diamond saw blades, but as a tradeoff it produces the best cut. Typically, the continuous rim is used for cutting marble, granite, porcelain tile, and ceramic tile. 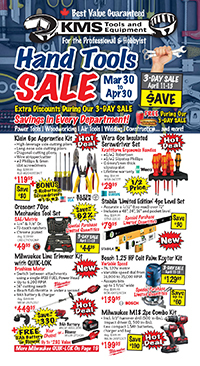 This entry was posted in Archives, Buying Guides, Power Tools and tagged Tile by Chris. Bookmark the permalink. Thanks for sharing this post. It is very informative. It is so descriptive that anyone can understand about the diamond blade. 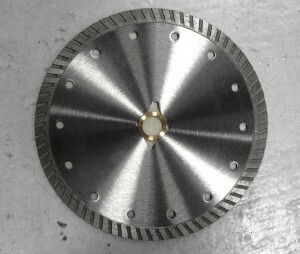 Few months ago I had taken the service of diamond blade from ERMRICH Inc. I am very satisfied with its products and services. basic but very important and clear information ! Exactly what I needed to know. Thanks for a clear simple explanation. Helpful. I was just cutting some tiles with my cheap wet saw with a segmented diamond blade, and was getting chipping along the cut. This never happened with my last couple tile jobs, and I remembered that I had used a continuous blade. I’m guessing that’s my issue here, luckily every cut I’ve done so far will be hidden by the trim. I’ll have to pick up a new continuous blade for the visible stuff.